Captured the size there Gary. Pretty serious by the look of it . 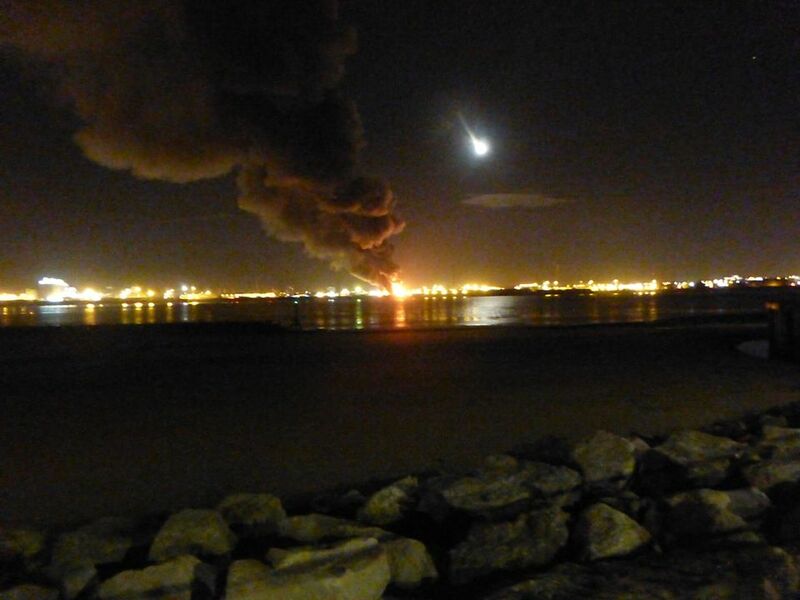 Firefighters are continuing to tackle a large fire at Seaforth docks. 6 fire appliances and two aerial units(combined platform ladders) have been deployed to a scrap metal recycling facility at Seaforth docks last night to tackle a large fire. Crews were alerted at 11.20pm and were on the scene at 11.29pm. A command point has been set up, the fire has been divided into sectors and water supplies have been secured. There are not currently any road closures in effect around the Seaforth docks area and smoke from the fire is not currently affecting any residential areas. Firefighters have now surrounded the fire and will continue firefighting. The incident is significant and ongoing as at 06.45am 22/10/16. Last edited by venice; 22nd Oct 2016 7:38am. Drove daughter to lime street station this morning and could see huge smoke like clouds. Wasn't sure if it was the power station at Fiddlers Ferry. On the way back towards tunnel looked like over seaforth area so still smouldering ? Saw similar smoke like clouds over wales yesterday and thought that was the power station at connahs quay--if its still there. Shocked I was last night when I saw it ... People at the time didn't know if a plane had crashed or what !!!! At this moment the fire still seems to be the same size as it was last night !!! Just hope there wasn't any injuries or fatalities !!! What, exactly, was burning? Surely not scrap iron? I suppose it WOULD burn if there were enough heat and a good supply of oxygen. Probably they don't drain the petrol from scrap vehicles so all it would take is a spark ? I doubt it is all scrap cars. Most of what I've seen is stuff that has been smashed into pretty small chunks, so any petrol would long since have evaporated. I expect we'll find ou in due course what was actually burning. Agree - very bad air tonight - went outside about an hour ago and came straight back in.